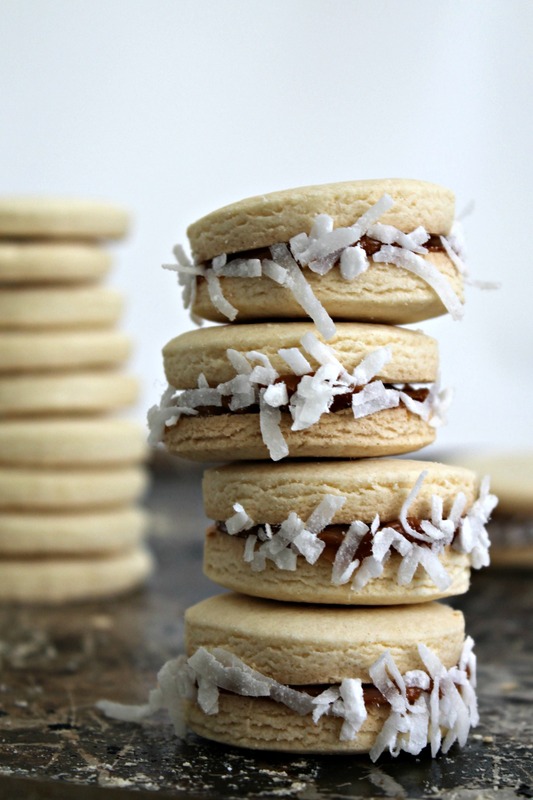 The traditional Argentinian cookies, the Alfajores, luscious dulce de leche are sandwiched between two buttery, crumbly cookies and rolled in shredded coconut. Perfect to accompany your afternoon espresso! Today, I’m excited to share the recipe for this time-honored Argentinian recipe: the Alfajor (pronounced al-fah-hor) cookie. Straight from Argentina, this recipe comes via my best friend’s mother, Susana. Born and raised in Cordoba, Susana ate her fair share of these delicate sandwich cookies and generously shared her family recipe with us. These cookies are cornstarch-based, creating a very delicate and melt-in-your-mouth treat. The dough is crumbly due to the lack of liquids in it, but comes together nicely. 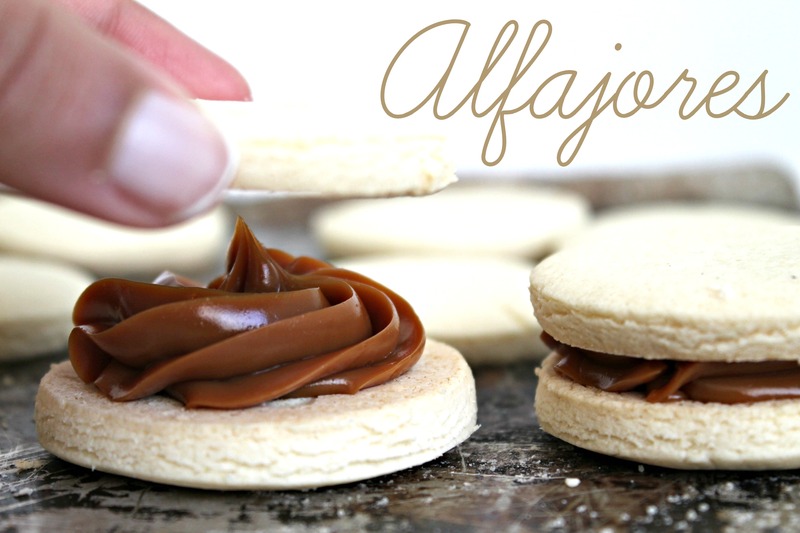 Generously filled with dulce de leche, a confection that’s luscious and sweet, true alfajor fans wait a day or two to consume them. They slightly soften after being sandwiched, lending to their familiar texture. Dulce de leche can be bought in cans, the most familiar brand, Nestle La Lechera, is most commonly found in the international or baking aisle of your local store. Can’t find dulce de leche? You can make your own by boiling a can of sweetened condensed milk for a couple hours. The slow, simmering water softly cooks the condensed milk into a deep, rich dulce de leche. Another great substitute is cajeta, which is dulce de leche made with goat’s milk instead of cow’s milk. Our favorite brand of cajeta is Fat Toad Farm! 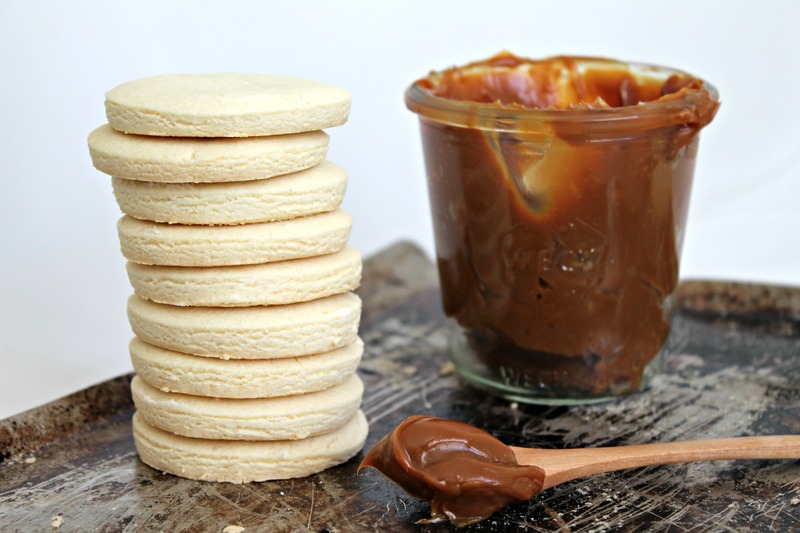 Bakers Royale has an oven method of making dulce de leche, worth checking out. Give these sandwich cookies a try, you’ll be surprised at how delicious they are. Slightly sweet, they’re perfect with your coffee or as an addition to a dessert table. Sprinkling them with powdered sugar is a classic way to serve them and adds a touch more of sweetness. Thanks again to Maria and her mom, Susana, for graciously sharing this recipe! 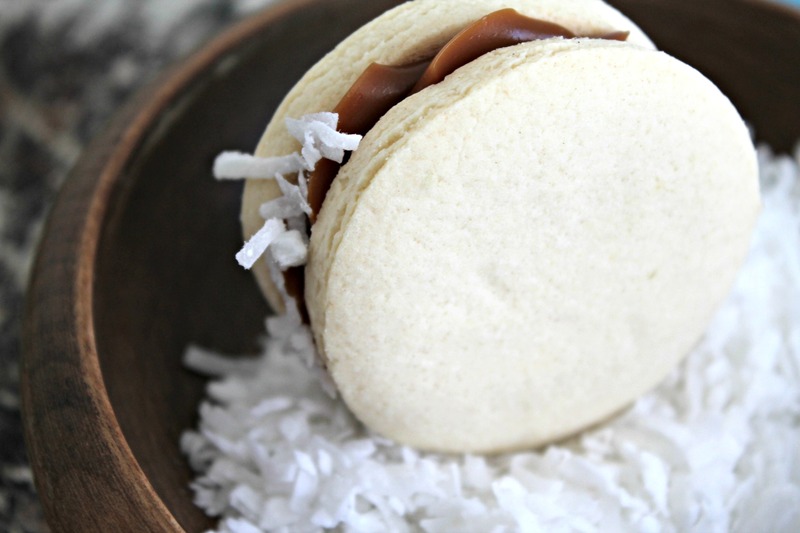 Dulce de leche sandwich cookies, traditionally called Alfajores, are a staple in Argentinian bakeries and households. Sift flour, cornstarch, baking soda, and baking powder. Set aside. Make sure your butter is very soft! Not melted, not warm, just perfectly soft. This will achieve the dough texture we need. Cream the soft butter and sugar for 5 minutes. Add egg yolks, vanilla extract, and lime zest. Roll dough out (in portions so it's easier to work with) on a lightly floured surface**, to a 1/4 inch and cut into circles. Place on an unlined cookie sheet, no need to grease it. Also, you can place cookies pretty close together - they won't spread at all, so make sure you're cutting them out the size you're going to want the baked cookie to be. Bake for 10-12 minutes and don't let them brown. Cool before filling. 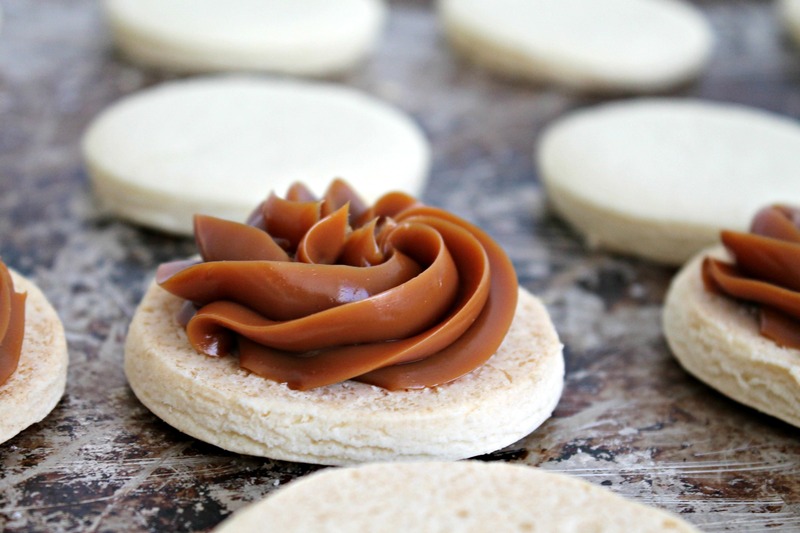 Slather or pipe dulce de leche on the underside of a cookie and sandwich using another cookie. Press together so the dulce de leche slightly seeps out and roll the edges in shredded coconut. *Note: You'll think that it's never going to incorporate, you're going to want to add some water - don't! Let it mix for a good 5 to 10 minutes and I promise, it will come together. **Note: If you can roll out the dough with NO flour at all, even better. When working quickly with this dry dough, you will only need to flour your rolling pin, avoiding incorporating more flour into the already dry dough. They just taste like flower. The doe was so sticky we ended up putting so much flower down in order for them not to stick, that now they just taste like flower. The whole double-decker thing wasn’t as easy as it looks. They didn’t have a taste. They just taste like flower. I was hoping for a little more other than just straight flower. Tip for future bakers; don’t put down too much flower on your counter top. 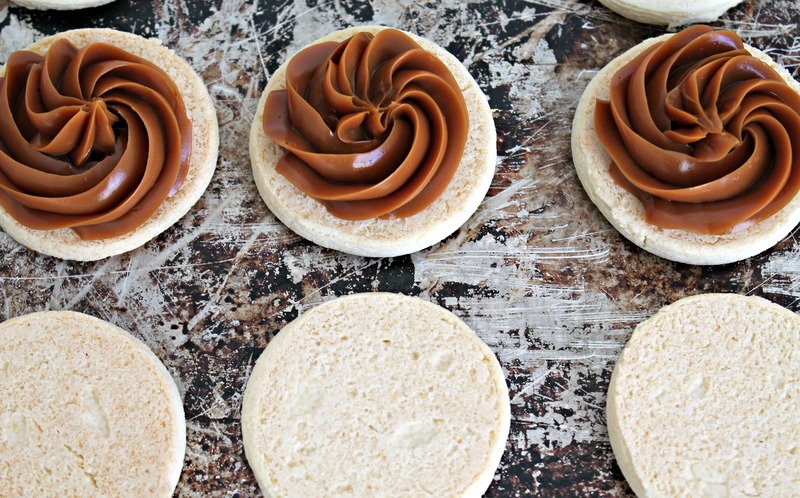 Is there anyone in the world who doesn’t absolutely love dulce de leche? These look delicious! These are delicious! It was a hit during Thanksgiving and I’m making them again for Christmas per our family request! I omitted the lime zest and they were still delicious! These cookies look so light and shortbread-like. Beautiful photos AND with the dulce de leche, wow! Marnely, these are probably to most beautiful Alfajores I have ever seen! gorgeous! and I absolutely love dulce de leche, and did make it once from scratch here at home because I wanted to see if I could .. after one fail, I got it. I’m definitely going to look for that Nestle brand. . I didn’t know they had/made dulce de leche! 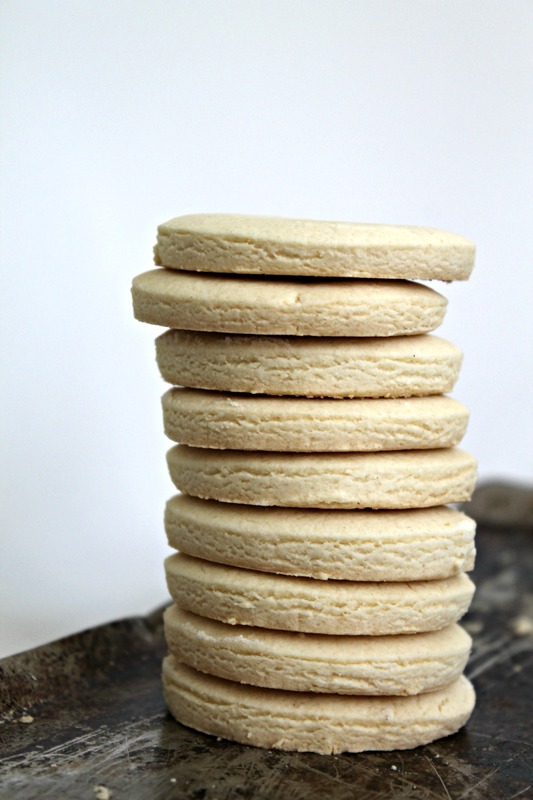 These are some of my favorite cookies ever and I haven’t made Alfajores in a long time. I love your filling! Yum! Oh wow, I am swooning over these! That center filling looks divine, so tempting! These look so, so good! And they’re beautiful, too!